We found a cool little hippy cafe across the street from the hotel for a nice breakfast. Hippy's love good coffee and this place had it goin' on. After breakfast it was time to load up the bikes and look them over for any necessary attention. This is a daily ritual. Dan found a beauty! His subframe had sheered off the bolt connecting it to the main frame. That's bad news when you have the subframe supporting the fuel tank and a couple sidecases. That couldn't hit the trail that way so we came up with a solution that would work and Dan called ahead for parts. With that out of the way we were on the road, to the trail. And leaving the parking lot my bike started to act up. The carb was giving me problems again. I decided it was rideable and besides it fit my schedule to have the bike looked at in Moab. But it was a tough ride. I had my first crash of the trip when a 90 degree left hand turn snuck up on me. I had the first 45 degrees covered but decided to throw it down short of the fence that was waiting for me. I got the bike up and got back underway without any trouble. The ride seemed pretty but I was working so hard to keep my bike under power that I couldn't enjoy it. I started to wish I'd stayed in Monticello to sort it out. But by now we were nearly halfway to Moab so I figured I'd still make it. Then we entered a park area with a long climb to the ridgeline on top. My bike struggled and I struggled riding it. It was bad enough that I decided to stop and fix the bike before going any further. So the rest of the guys had some lunch and I took my carb apart. But my attempt at fixing the carb only made it worse. It was completely unrideable. I made another attempt but it didn't help. I was stranded. Dan stayed behind with me and then towed me to the downhill side of the mountain where I coasted down. I sure am glad we took the time to make a good fix on his bike. He was towing me with his broken, but temporarily repaired, subframe. The last sign I saw before I started coasting was 26 miles to Moab and I finally came to a rest 9 miles from Moab. But in the course of trying to keep cornerspeed I crashed again, this time on my left side. When we got to the bottom of the hill I gave the bike one last try and discovered that on flat ground I could get the bike moving at idle with alot of clutch. This seemed to work and before you know it I was chugging along at 30 mph toward Moab and I was able to keep it running all the way to the parking lot of our hotel. Mission accomplished. My bike has an appointment at 8 am tomorrow with a local mechanic. I hope he's a miracle worker. Dan has to drive to Grand Junction for his parts. So our day in Moab will likely be spent fixing our bikes instead of riding. I'm beat up from head to toe from crashing on both my sides today. If I can get the swelling down I'm going to rent a mountain bike and go for a ride. 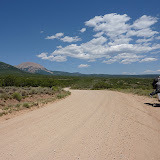 I know this is a motorcycle odyssey but coming to Moab and not cycling is like going to Jerusalem for the beach. Beth stayed in Montross, CO last night and was on the phone with our group bright and early saying she was headed to Moab to rejoin the group. I haven't seen her yet but I think she went riding with Ryan and Jeff. Gregg was at the hospital when I left Monticello this morning. We haven't been able to reach him yet to get his status. I'll update the blog later. Just as a footnote, the hotel manager called her husband to take Gregg to the doctor since he couldn't ride his bike. There are still some nice people in the world. And we actually found quite a few of them in Monticello, Utah. Glad that you were able to find coffee in the state of Utah.